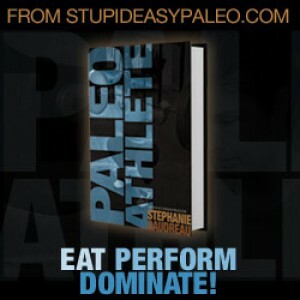 I wanted to let everyone know about a great new resource just released by my friend Steph Gaudreau of Stupid Easy Paleo. Steph has taken her 20 years of competition experience and combined it with her years of experience teaching high school chemistry and biology to publish an outstanding eBook called The Paleo Athlete. If you are an athlete of any sort (CrossFit, Powerlifting, or endurance athlete) and interested in learning how to properly fuel your athletic performance, this is the book for you. It will teach you how to utilize nutrient dense whole foods, proper rest and recovery, and proper pre and post workout nutrition to perform at your best. This book is a big part of the foundation for the seminar The Whole Athlete, currently being offered through collaboration between Steph and Dallas Hartwig of Whole 9 Life. I had the pleasure of attending the inaugural seminar at CrossFit Love in Philadelphia a few weeks ago, and I was impressed with the material covered. Whether you are a weekend warrior, competitive athlete, or physical therapist working with athletes, you will benefit from reading and understanding this information.